The newest adaptation of Stephen King’s seminal 1986 novel ‘It’ is a remarkable achievement. This film never forgets what makes this story special: the loveable losers at its center. It is joyful and laugh-out-loud funny and never becomes too dour. Set in the King-invented town of Derry, Maine in the summer of 1989 this is a coming of age story masked as horror film. The premise is simple, something awful is lurking under Derry. It is evil. It feeds on fear. It is killing children. And a group of charismatic misfits are the only ones trying to stop it. In the novel, Derry is one of Stephen King’s most malevolent creations. One of the most common and effective ways that the master of horror managed to take hold of the imaginations of readers in his early career was by taking common things and making them evil. In ‘Christine’ your car wanted to kill you, in ‘Cujo’ it was the family dog, in ‘Pet Semetary’ it was the family cat. With ‘The Shining’ he made you afraid of hotels. He has even had a killer washing machine. Derry on the other hand is an evil town. This is not like his most famous imaginary Maine town: Castle Rock. Castle Rock is a place where bad things happen, but Derry was born bad. One of the effective changes in this adaptation is moving the story from the 1950s to the 1980s. After all, that is one of our biggest current nostalgias. For me, I’m smack dab in the middle of it. I was the exact age in 1989 that The Losers Club were. You can see a movie theater marquee frequently in the background advertising ‘Batman.’ I remember being 12 years old in 1989. I remember the life-changing event of seeing ‘Batman’ as a 12 year-old in 1989. I remember the music and the feeling of that time and this film nails it. This is also emblematic of one of the many things ‘It’ does right. 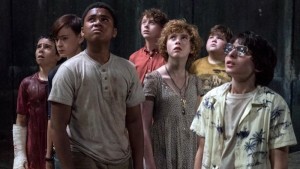 ‘It’ not only draws from the wildly popular ‘Stranger Things’ but there is a real ‘Goonies’ and ‘Monster Squad’ vibe here. These are kids who swear and are vulgar. The smart decision to make this film rated R cannot be understated. It gives the movie a real edge. This is something that could have gone so wrong by watering things down to get a PG-13 rating. But that would have taken away so much of the realness and the stakes. This is ostensibly a kids movie and is the only film I can think of with a cast of 12 year olds that is this brutal and has a much-earned R rating. The fact that this film was released in this state is a miracle on its own and the project is better for it. The film is not without its flaws. 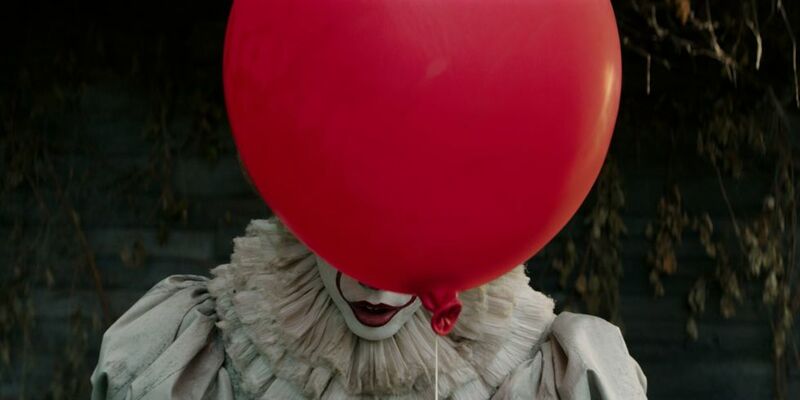 While Bill Skarsgard is effective as Pennywise, he is unfortunate to stand in the shadow of the luminous original portrayal in the television miniseries by Tim Curry. Tim Curry owned Pennywise in a way that almost seems unfair to any actor trying to play the role after. He was funny and malicious and charismatic in a way that Skarsgard does not come close to. I am willing to forgive that however. Those are some big clown shoes to fill and Skarsgard makes the smart decision to play Pennywise the Dancing Clown in a completely different way. While he flirts with the overtly evil clown trope that can seem silly in a post-Insane-Clown-Posse world, mostly his performance is drooling, unhinged and perfectly bizarre. The film also relies far too much on computer generated effects in a way that will likely age very badly. Despite these flaws, director Andy Muschietti has delivered something truly special. Much like Muschietti’s previous film ‘Mama,’ this not so much a horror film as a dark fantasy. It has some scares but I wouldn’t call it scary. It’s more like a good-spirited funhouse that is more interested in having you jump out of your seat than creating a building sensation of dread. For this reason and the delightful chemistry of the main cast, I could see this film being a modern day classic. I know that it will be in my regular rotation. The film is also stunningly shot by cinematographer Chung-hoon Chung, a frequent collaborator of Chan-wook Park. This is the same man who shot ‘Oldboy.’ So if you’re wondering why it looks so darn pretty, now you know. Also of note is the sweeping musical score by relative newcomer Benjamin Wallfisch (‘A Cure For Wellness’, ‘Hidden Figures’) which adds so much of the magic in the film. The soundscape eschews typical creepy music in exchange for something full of hope and youthful wonder that would feel at home in a Harry Potter film but serves to keep ‘It’ from feeling over-serious. Once again, the greatest success in ‘It’ is the perfect cast. It says something when my favorite scene in a horror film is a sun-soaked moment of the kids swimming in the quarry. It also must be reiterated how funny this film is. My audience was consistently laughing throughout. There are some truly iconic moments, one involving sunbathing that had the audience knowingly giggling and a few jokes involving New Kids on the Block that were more clever than they had any right to be. Standouts among the excellent cast were Sophia Lillis as Beverly Marsh who has the unenviable task of being the only girl in the Losers Club and handles it with wit and cool confidence. She truly embodies the Bev of the book, she is a smart aleck, damaged and good-hearted and is easily believable as the girl who everyone has a crush on. If she doesn’t become a star, I’ll eat my hat. Finn Wolfhard is also incredibly funny as Richie Tozier. He has some of the best lines in the script and applies his experience working as part of a ensemble cast as a transport from ‘Stranger Things’ to bring appreciated levity in some of the film’s darkest moments. I look forward to how Chapter Two will build on this terrific start. The second film will find 40 year-old versions of these characters leaving their lives as successful adults to return to Derry and fight the resurgent evil of Pennywise. With the right execution the second part could be just as enthralling as the first and I can’t wait. Halloween has come early this year and ‘It’ is beautiful.